Zlatan Ibrahimovic claims his incredibly successful career has been motivated by “lots of people” who wanted him to fail. MAN UNITED FORWARD Zlatan Ibrahimovic believes that racism and envy have spurred him on to enjoy a phenomenal career. 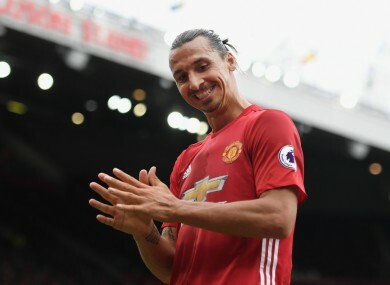 The Swede moved to Old Trafford prior to the 2016-17 season, having won titles with Ajax, Inter, Barcelona, AC Milan and Paris Saint-Germain in a glittering 17-year stretch. And Ibrahimovic has now revealed that he was motivated by the treatment he has been given by those who “never wanted [him] to make it”. “People essentially have got the picture of me as ‘cocky’ and ‘arrogant’ because that is what newspapers wrote in the beginning,” he told Aftonbladet after winning Sweden’s ‘Guldbollen’ player of the year award for a 10th year in a row. “Then, there is also a fair deal of latent racism, because my name is ‘Ibrahimovic’ and not ‘Svensson’ or ‘Andersson’. I was something completely different. “And then there is, of course, envy. Lots of people never wanted me to make it because of who I was, how I spoke and acted. Ibrahimovic has scored six goals in 11 Premier League appearances so far this season. Email “Ibrahimovic was motivated to succeed by envy and racism”. Feedback on “Ibrahimovic was motivated to succeed by envy and racism”.